How do I sync my recipes between multiple devices? How do I add multiple images to a recipe? How do I download recipes from Pinterest? How do I find my Paprika version number? How do I share recipes with other users? How do I remove a recipe rating? How do I set up the bookmarklet on my iPad? How do I import an emailed recipe? How do I rename or delete a category? On all platforms, Paprika follows the language set in your operating system's settings. If you want to change the language used by Paprika, you will need to change it at the operating system level. What languages does Paprika support? Does Paprika support metric measurements? 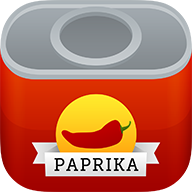 How many recipes can I have in Paprika?